In Kista the Electrum Laboratory with a 1300 m2 cleanroom area and 1500 m2 additional laboratories is outstanding for fabrication and characterization in the nano and micro scale, supporting the whole chain from education, research and development, to prototyping and production. At KTH Campus the Albanova Nanofabrication Facility has a 285 m2 cleanroom and 60 m2 additional laboratories. With focus on direct writing technology, the Albanova Nanolab is a flexible resource for basic research requiring nanofabrication and nanocharacterization with a wide variety of materials and substrate. Both the laboratories maintain exciting meeting places for students, researchers, and entrepreneurs in different disciplines, ranging from fundamental science to mature technology. In this environment we offer you the chance to realize your ideas. - A fully equipped cleanroom with complete and highly qualitative process lines for device research and manufacturing. - A flexible cleanroom environment for materials and device oriented research and development. - World class characterization laboratories, providing an integrated in-depth understanding of materials, structures, and devices by combining relevant analysis techniques from our palette. - Sophisticated software for advanced calculations, simulation and design. - Commissioned research and development. - Courses in process technology, characterization and cleanroom infrastructure. You may also rent detached laboratory space for your own specialized tools, and simultaneously gain access to our full range of services. As part of the Myfab network access is offered to all the equipment within the network. 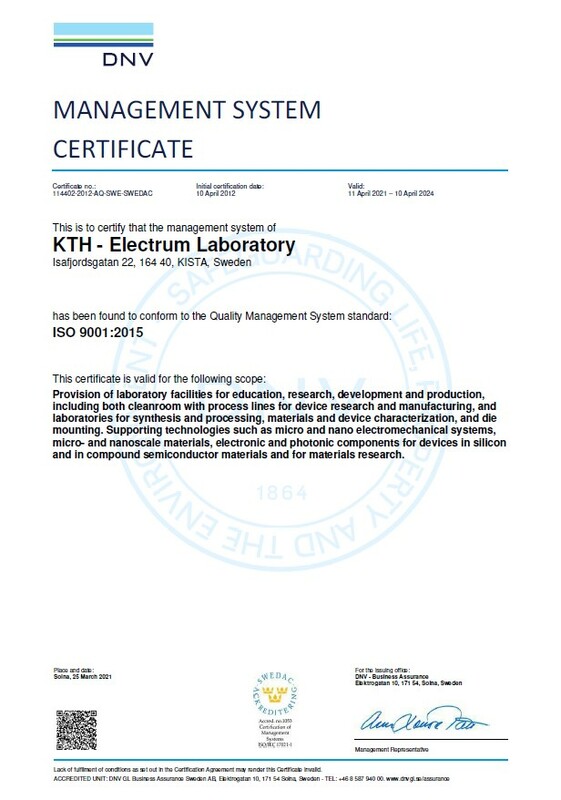 The Electrum Laboratory is certified according to the international ISO 9001:2015 Quality Standard. 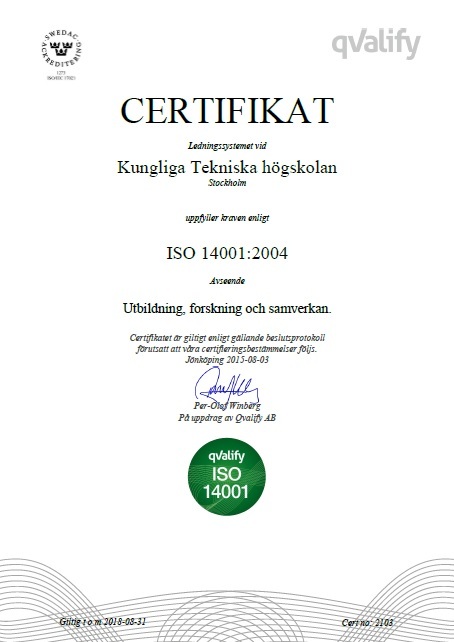 The Electrum Laboratory is part of the Royal Institute of Technology (KTH) which is certified according to the international ISO 14001 Environmental Standard.